Prepare students for success on the AP Environmental Science exam with these supplemental materials that integrate content review, formative assessment, and practical test preparation for every unit in your APES curriculum. Easy to integrate into daily lesson plans, these workbooks coincide with each unit, providing consistent reinforcement and applied test practice throughout the year. Each workbook includes 100 multiple choice questions covering a range of subtopics, with detailed answer explanation for every question. Five free-response questions replicating types of questions found on the AP exam are also included, with detailed explanation and scoring guides. 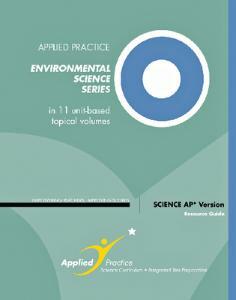 Invaluable teaching aides and strategies of experienced and successful AP Science teachers are provided with every book, enabling novice AP teachers to learn from the experience of others, and veteran teachers to compare and improve existing methods. Workbooks are available individually, or as a set.